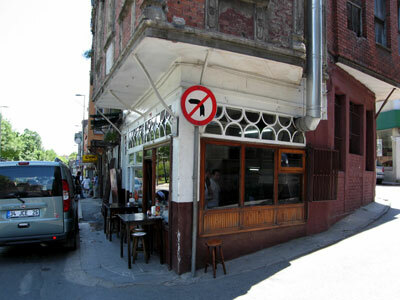 Perhaps it’s the proximity of the waters of the Golden Horn or the weathered wood interior, but we get a distinctly maritime feeling at Köfteci Arnavut, a tiny köfte joint in the historic Balat neighborhood. The members of the Iştay family, who opened the place in 1947, seem to think the same thing, running the place with ship-shape efficiency. Seventy-six-year-old father Ali is constantly sweeping the floor and wiping down the Formica-topped tables, like a sailor dutifully swabbing the decks. Daughter Mine, meanwhile, stands by the front door, issuing clipped, urgent orders to the hustling grillmaster and waiters, as if she were the captain of a tanker navigating particularly treacherous waters. Of course, we’re talking köfte here – and in Turkey, grilled meatballs are serious business. In Istanbul, like in other Turkish cities, every neighborhood has several small restaurants serving köfte, usually for a demanding lunch crowd that doesn’t forgive any missteps or badly prepared food. There really is little room for error. Of course, with so many köfte restaurants competing against each other, how does one place distinguish itself from the others? In our experience, the truly winning places (like Köfteci Hüseyin near Taksim) veer away from the traditional style of meatball, which is a slightly chewy (even rubbery, but in a good way), log-shaped köfte, and cook up something more patty-like. In the case of Köfteci Arnavut, the final product is a very tasty and unusually thin, square-shaped köfte that reminds us of American-style country sausage, cooked on a charcoal grill until it is slightly crispy around the edges. Along with the köfte, the restaurant serves piyaz, the cold white bean salad that is the traditional accompaniment to the meatballs, as well as a small assortment of soups and cooked dishes, such as chickpea stew and Albanian-style liver (Arnavut Ciğeri), small cubes of fried lamb’s liver. What also sets Köfteci Arnavut apart from other meatball purveyors is its location, right at the entrance to Balat, one of our favorite places in Istanbul for a walk. Once a primarily Jewish and Greek enclave (there are a few functioning synagogues and churches still left in the area), parts of Balat feel preserved in time, with narrow streets lined with small, Ottoman-era buildings, many of which have been renovated in recent years as part of a UNESCO project. Köfteci Arnavut, on the other hand, seems to have fallen outside of UNESCO’s purview. The small, two-story brick building the restaurant calls home certainly looks like it could use some restoration of its own, while the interior – though spick and span thanks to owner Ali’s constant sweeping and wiping – is well worn. Still, as the top-notch köfte and the dedicated service shows, the restaurant has set a course that needs little improvement.